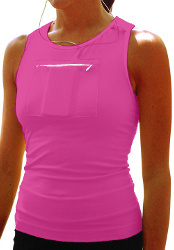 Gracie's Gear and Training is a company that sells the Pocket Pouch (the pocket sports bra and tanks). The pocket is outside of the bra so no chafing occurs. It also helps to sweep sweat away quickly to help keep you dry. The shirt that I got to review comes in several colors such as pink, red, black and turquoise. They also have a few different styles of this top. Here is some information about the company: "gracie's gear is creator and producer of the innovative POWER POUCH™ pocket sports bra and tank, designed to offer comfort and convenience for the active woman. Our mission is to provide products and services that encourage women of all fitness levels to become active and stay active. From our fitness apparel to our training approach, we aspire to eliminate barriers to exercise while inspiring all women to find their inner athlete." I chose the shirt above in a hot pink. I like it a lot! I love that there is a pocket to hold my key, Ipod, etc. if I were to go on a run. Also, something to note is that these shirts fit larger than normal. More like a women's size than a juniors. They are long enough where they don't ride up which is nice. The shirt retails for $55 on the Gracie's Gear site. Also, Gracie's Gear is more than just about selling tops. They are about giving. They have been very generous to charities by helping children with cancer. Check out their website for more information. Visiting from Thirsty Thursdays... Hope you can return the favor. Feel free to join our weekend Alexa hop!We are also looking for mom bloggers to feature on our site! That's so cool! I love the pouch for the iPod! The pockets are a major bonus for me! Keep my phone and a key and I am geared up to run wouldn't ever wear anything else!!! I love my Gracvie's Gear tops. I have been using them for almost 2 tears and won't run in anything else. The pocket hold my I-Pod and car key with no problem. I don't even know it's there. When I wore my I-pod on my arm, I put my gu gels in the pocket...again, didn't even feel them. LOVE LOVE LOVE my gracie's gear tops!!!! !